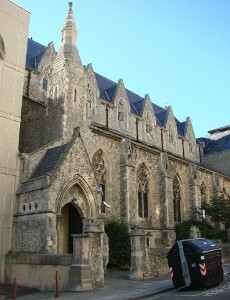 Built in 1858 as a proprietary chapel in Hove near the boundary with Brighton, the first dedication was to St James. In 1885 it was acquired at a cost of £13,480 to become a parish church (KD 1899). A further £2243 were spent on improvements (ibid) and the dedication was changed (VCH 7 p268) to avoid confusion with the church of that name in Brighton. There seems to have been no pressure to rebuild as happened with other chapels that became parochial, doubtless because the design by H E Kendall junior (BN 48 p969) was relatively recent and impressive by the standards of such chapels, especially inside, combining new and old fashioned features on a cramped site. The only façade, facing the street, is faced with that favourite mid-Victorian material, rough-hewn ragstone. The steeply pointed dormers of the clerestory break the roofline, creating a jagged rhythm. Instead of mullions, each window has a turned shaft, looking ahead to the 1860s. East of a lower south (actually west) transept, is the base of a tower, which was intended to be octagonal. More conservative is the spacious interior, which was effectively a single space, with a tall chancel arch and arcades that have accentuated rings on the piers. The roof throughout has prominent hammerbeams with angels and cusping; the corbels on which this rests were carved by T Earp (BE(E) p242). Off the chancel is a lower north chapel. In 1870 Somers Clarke junior added a vestry (B 28 p38) and in 1879 the interior was renovated, with improvements to the entry passage from the street (B 37 p1063). 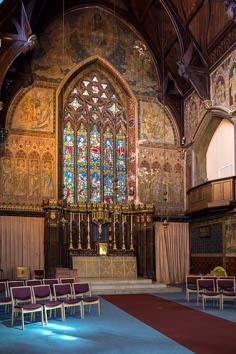 The south chapel was remodelled in 1906 by W Tapper with a new wagon-roof (BE(E) p243). As built and like many proprietary chapels, the congregation had evangelical leanings and it was not until the 1870s that after a change in its sympathies the fine fittings and glass began to be acquired. This continued after the change to parochial status. Little was done to the structure until 1927 when, possibly because the construction had been done cheaply, the roof had to be replaced and H M Pett repaired the external stonework (CDG NS 83 p360). By the 1990s the building was too large for present-day needs and after an earlier plan had been rejected, N A Lee-Evans designed five storeys of accommodation for the homeless to be inserted above a new church hall in the western nave (1 p32). The rest of the church is now entered near the base of the intended tower. 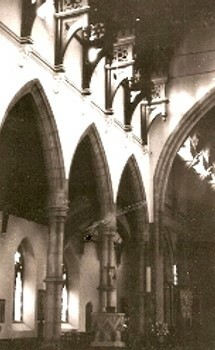 The interior was replanned around a central altar on a level floor with chairs in place of pews. 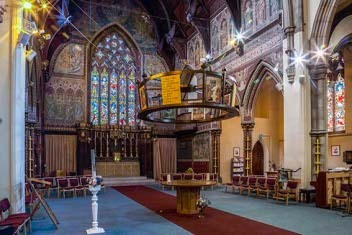 The scheme was completed in 2002 (CT 3 May 2002 p12), but the arrangement did not prove a success and in 2014 it was decided that parochial worship would cease. In the following year the church was taken over by the Chemin Neuf Community, a joint initiative of the diocese of Chichester and the Roman Catholic diocese of Arundel and Brighton. This continues with the provision of accommodation and holds regular services. (NB. Most except the Stations of the Cross survived the reconstruction, though some, like the font, were moved. Others were little used after the re-ordering and some of the glass became hard to see. No announcement has been made about the future of this fine array of fittings after the arrival of the new community). Altar: (Lady Chapel) W Tapper of c1906 (Clarke papers) as part of his remodelling. It is baroque in style. Other fittings there may be by M Travers, to whom the whole south chapel has been erroneously ascribed (Blagdon-Gamlen p39). Font: 1910, W Tapper. Round alabaster bowl with a tall, gilded openwork oak cover. It was moved nearer to the entrance during the remodelling (1 p33). 1. 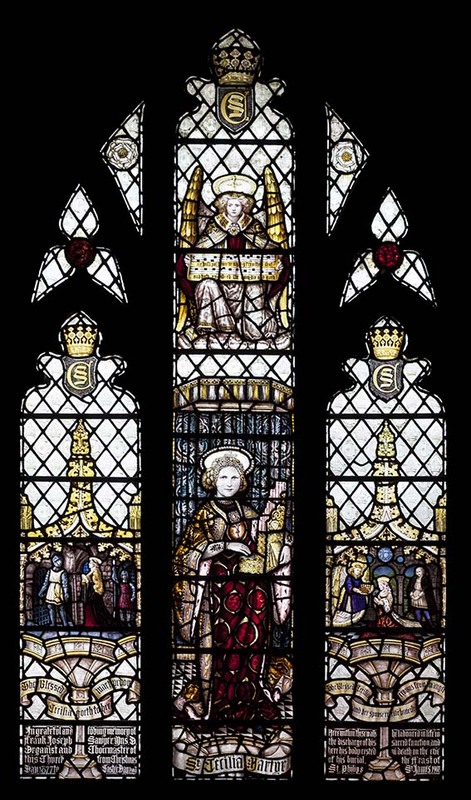 (‘West’ window) Clayton and Bell, 1870 with the life of St Patrick (B 27 p1063). 2. (‘East’ window and ‘south’ aisle, third window) Designed by W Butterfield, 1870-74 (Dale p116) and made by A Gibbs (www.stainedglassrecords.org retrieved on 4/2/2013). 3. 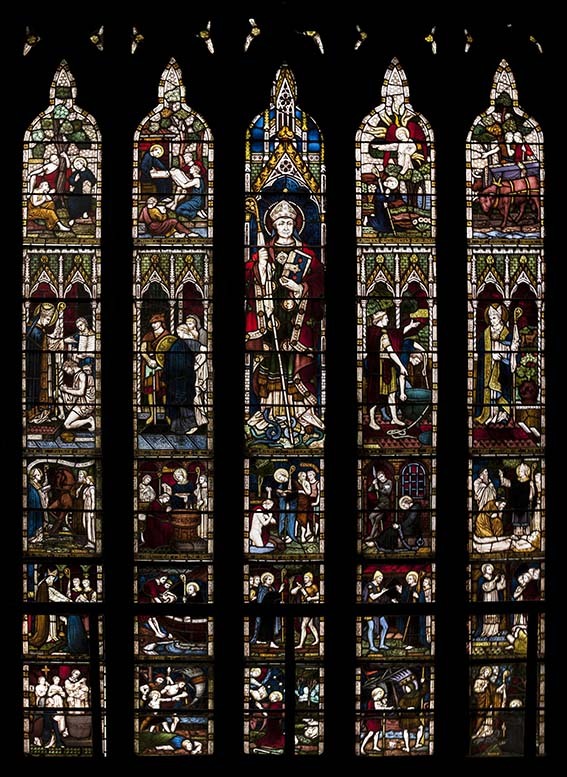 (‘South’ aisle, first and second windows) Designed by Butterfield, 1874 and made by ‘Gibbs’ (BN 27 p417). 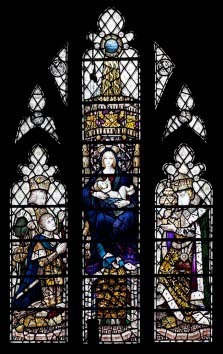 In view of the authorship of the ‘east’ window and other glass this might be presumed to be Alexander, but one is signed by C A Gibbs, his brother. 4. (‘North’ aisle, second and third windows) A Gibbs, 1868-72, designed by Butterfield. The figure of Moses is especially singled out as his work (B 26 p951). 5. (‘South’ aisle, sixth and seventh windows) J Powell and Sons, 1889, designed by H Holiday (Order book) (Annunciation and Presentation). 6. (‘North’ aisle, ‘east’ and first windows) Made by E O’Neill and C O’Neill and designed by W B Reynolds, c1908. (www.stainedglassrecords.org retrieved on 4/2/2013). The design is unusual at this date in the amount of clear glass used. Lectern: Brass by W Butterfield, 1867 (Thompson p497). As well as the usual eagle, there are a figure of St Patrick and a tower on the stem. Mosaics: (By font) J Powell and Sons. B Clarke provides the date of 1909 (Clarke papers), but more recent research (Hadley list) suggests that they date from 1890 (designed by C Whall) and 1894 (designed by E Penwarden). 1. 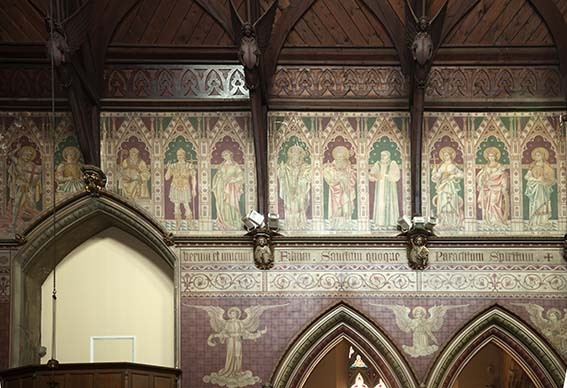 (Chancel walls) Clayton and Bell, 1892, costing over £900 (CDK 1892 pt 2 p148). There are tiers of figures of saints and the Apostles, painted in grey against a reddish-brown background. 2. (Stations of the Cross) L Ginnett and executed after his death in 1946 by C Knight (EH). Pulpit: Bath stone by Sir George G Scott with variegated marble shafts and figures. Reredos: Somers Clarke and J T Micklethwaite, 1888. Gilded red sandstone. My thanks to Nick Wiseman for the photographs of the interior, glass amd fittings.